It has been a very chilly and damp day today in NC. Nothing drives me to the kitchen like this kind of weather! 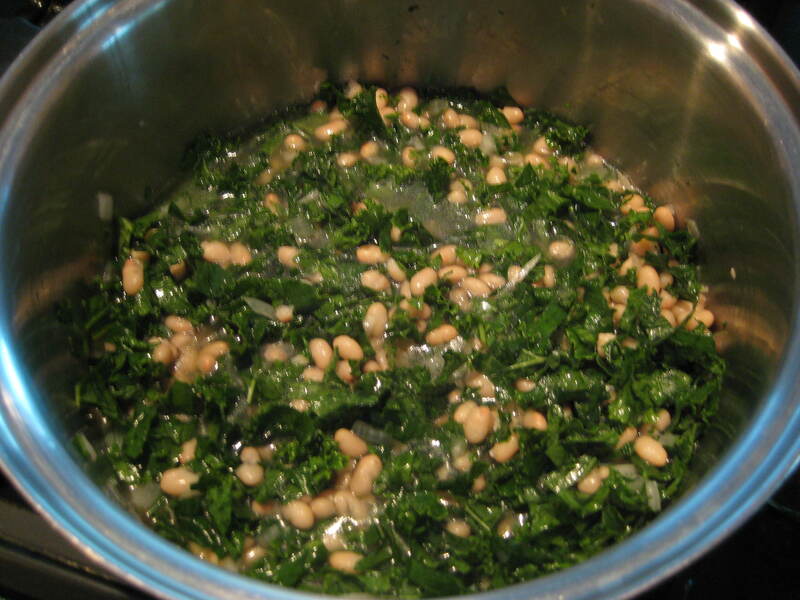 So tonight, I made one of our favorite soups for dinner: White Bean and Kale. The husband and I are both perfectly happy with a big bowl of hot, hearty soup and a slab of bread or stack of crackers as a meal. This recipe is a fast fix while some of our other favorites are better suited for the crock pot. And speaking of the crock pot, I think it’s pretty darn wonderful to walk in the door at the end of a long work day to the mouth-watering aroma of something that’s READY TO EAT now! In addition to being easy, this soup gives us a vegetarian meal. We try to do that every so often; it’s good for us. So…ladle up and enjoy! Saute garlic and onion in oil. Add the broth/stock, beans and kale. Bring to a boil and let simmer until kale is tender. Add pepper and serve. We end up with 1.5 bowls of soup each. You could probably serve 4 if you added sandwiches, cheese toast or a salad. I hope you’ll try it. Let me know if you enjoy it!